Back in the day when quick-witted MC’s Busy Bee and Kool Moe Dee went mic-to-mic in Harlem, little did they know they had started a war of words that still rages today. 50 Cent vs. Ja Rule. Jay-Z vs. Nas. Tupac vs. Biggie. Common vs. Westside Connection. Cube vs. NWA. KRS-ONE vs. Nelly. Ice T vs. LL Cool J. These and many other notorious MC battles punctuate BEEF, the definitive documentary on this enduring urban phenomenon. 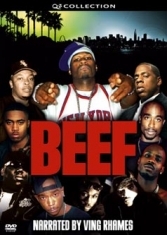 QD3 Entertainment will release BEEF September 30th on DVD and videocassette via Image Entertainment, Inc. (NASDAQ: DISK), the distribution powerhouse long recognized as the market leader in music video long form DVDs. BEEF is the third in a 12-program series by QD3 Entertainment and Image, following the Tupac Shakur biopic Thug Angel and The Freshest Kids, on the history of breakdancing. This latest gripping documentary, executive produced by Quincy “QD3″ Jones, III, directed by Peter Spirer (Rhyme and Reason, Thug Angel, Modern Warriors), and produced by Casey Suchan (Thug Angel, The Freshest Kids), examines the history, tracks the evolution, and explores the social, political and economic ramifications of this increasingly controversial art form. BEEF explores the simmering street energy of Hip Hop as it plays out on wax and spills over from the studio into the neighborhoods of urban America. Rappers talk frankly about street life, how they got into the game, their favorite battles and current beef in exclusive interviews, rare archival footage, and never-before-seen performances featuring 50 Cent, DMX, Ja Rule, Mobb Deep, Ice T, Dr. Dre, Common, Ice Cube, Cypress Hill, NWA, Treach, Mack 10, Beanie Sigel, Snoop Dogg, Tupac, Jay-Z, Nas, KRS-ONE, MC Shan, Busy Bee, Kool Moe Dee and others. Emmy Award winner Ving Rhames (Mission Impossible, Baby Boy, Don King: Only in America, Undisputed, the upcoming Envy with Ben Stiller), Def Jam Records co-founder Russell Simmons, hip-hop historian Davey D, and former pro football player and gang mediator Jim Brown are among the other notables who provide an inside look. BEEF chronicles early MC battles including KRS-One vs. MC Shan, breaks down the break-up of NWA, follows the rivalry between the East Coast and the West Coast that led to the murders of Tupac Shakur and The Notorious B.I.G, reveals underground disputes between rap crews, and uncovers the dark realities behind today’s beef between multi-platinum selling artists Ja Rule and 50 Cent. From skills on the mic to skills on the street, BEEF serves up prime cuts from rap’s most famous and controversial players, questions the future of the lyrical MC, and contemplates Hip Hop’s next verse.